A new paper claims US total greenhouse gas emissions have warmed the planet a whopping two-tenths of one degree [0.2C] over the past 160 years. Furthermore, this claim is made under the assumption that all of the warming since 1850 is due to greenhouse gases and not natural variability or natural recovery from the end of the Little Ice Age in 1850. And this claim is made on the basis of overheated climate models already falsified at confidence levels of 95-98%+. There is no evidence that 0.2C warming is harmful to the planet and could have instead been net beneficial. China, India, and other developing nations are demanding the US and other industrialized countries agree to pay $100 billion per year indefinitely to them as a precondition to agree to a climate scam treaty in Paris 2015. Even if the UN climate propaganda was true, this new paper finds that by 2030, the CO2 emissions of developing and developed countries will almost be equivalent. Understanding the relative contributions of individual countries to global climate change for different time periods is essential for mitigation strategies that seek to hold nations accountable for their historical emissions. Previous assessments of this kind have compared countries by their greenhouse gas emissions, but have yet to consider the full spectrum of the short-lived gases and aerosols. In this study, we use the radiative forcing of anthropogenic emissions of long-lived greenhouse gases, ozone precursors, aerosols, and from albedo changes from land cover change together with a simple climate model to evaluate country contributions to climate change. 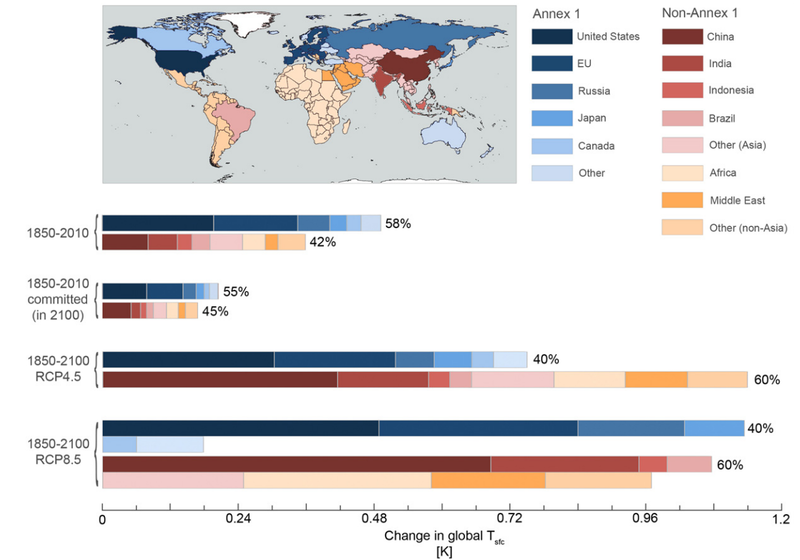 We assess the historical contribution of each country to global surface temperature change from anthropogenic forcing ( Δ Ts), future Δ Ts through year 2100 given two different emissions scenarios, and the Δ Ts that each country has committed to from past activities between 1850 and 2010 (committed Δ Ts). By including forcings in addition to the long-lived greenhouse gases the contribution of developed countries, particularly the United States, to Δ Ts from 1850 to 2010 (58%) is increased compared to an assessment of CO2-equivalent emissions for the same time period (52%). Contributions to committed Δ Ts evaluated at year 2100, dominated by long-lived greenhouse gas forcing, are more evenly split between developed and developing countries (55% and 45%, respectively). The portion of anthropogenic Δ Ts attributable to developing countries is increasing, led by emissions from China and India, and we estimate that this will surpass the contribution from developed countries around year 2030. Two primary drivers of average global temperature have been identified. They very accurately explain the reported up and down measurements since before 1900 with coefficient of determination, R2>0.9 (correlation coefficient = 0.95) and provide credible estimates back to the low temperatures of the Little Ice Age (1610). R2 = 0.9049 considering only sunspots and ocean cycles. R2 = 0.9061 considering sunspots, ocean cycles and CO2 change. The tiny difference in R2, whether considering CO2 or not, demonstrates that CO2 change has no significant effect on climate. The coefficients of determination are a measure of how accurately the calculated average global temperatures compare with measured. R2 > 0.9 is excellent. The calculations use data since before 1900 which are official, accepted as valid and are publicly available. Solar cycle duration or magnitude fail to correlate but their combination, expressed as the time-integral of solar cycle anomalies, gives an excellent correlation. A solar cycle anomaly is the difference between the sunspot number for a year and an average sunspot number for many years. Everything not explicitly considered (such as the 0.09 K s.d. random uncertainty in reported annual measured temperature anomalies, aerosols, CO2, other non-condensing ghg, volcanoes, ice change, etc.) must find room in the unexplained 9.51%. The method, equation, data sources, history and predictions are provided at http://agwunveiled.blogspot.com and references.